I generally don’t publish back-to-back posts for the simple reason that “a little lunch” was created to be a tidbit, rather than a full-course-meal. However, some things are SOOOO good, it would be a disservice not to share. Combine cucumber slices and salt; let sit 30 minutes, then drain. In a large bowl, combine lettuce, tomatoes, onions, cucumbers and olives; toss lightly. In a small measuring cup, combine equal parts of olive oil and lemon juice; add Greek seasoning to taste. Drizzle over salad and toss again. Add cheese (I prefer it sprinkled over the top); serve immediately. The mysteries of the universe may elude me (yet), but it helps to ponder them over a tasty salad. Mmmmmm! I love Greek salads. thanks for visiting and commenting my blog, yours is very interesting, beautiful, visually attractive and I totally identify myself with it! following you right away if you tell me how to find your followers list and hoping to have you with me as well! Is there anything better for lunch than a Greek salad? I love it! 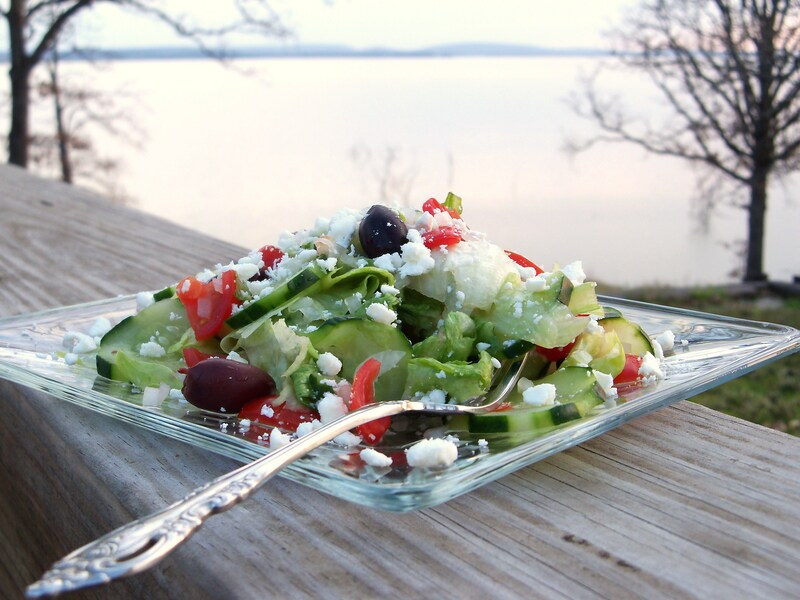 Wow – that looks fantastic and I LOVE Greek Salad! Your photo with the lake in the background is lovely. The mysteries of life never seem frightening to me when I have a bowl of delicious food in front of me–I’m totally with you on that. And this salad certainly looks like it fits the bill in that regard. The best part of a greek salad is the feta as far as I am concerned-yum! It is the best when put with fresh veggies. Healthy, fresh and tasty-well worth having for lunch. Enjoy the day Kim! Love feta … actually I just love cheese and esp feta. I love making salads like this all the time, so light and refreshing. A super lunch! Ping, that’s so cool that you commented in Greek — enjoying life is what it’s all about! Thanks for your wonderful thoughts! I had no idea that there was Greek seasoning. I would have thrown Feta & olives on it and said “It’s a Greek Salad’. Now I gotta go find this stuff. Dawn, I looked at the ingredient list on the seasoning and it’s pretty much what I throw in to “flavor” a vinaigrette — garlic, salt & pepper, oregano (this one has sage, too.) Your version of a Greek salad sounded good to me! This is by far one o my favorite salads! The crunch of the cucumber with the creamy saltiness of the feta= perfect! Heather, what a wonderful way to describe the play of flavors and textures! (Wish I woulda thought of that, lol.) Thank YOU! Made me smile! :) Many thanks, lovely Isabelle! I am not a tomato-seeder; do you seed the cherry tomatoes? Sid, they pretty much seed themselves when you quarter them :) — that’s close enough!